Comments It is only for the sake of segregation and mental ease that gemstones may be termed precious or semiprecious. In today’s world, scarcity and rarity of true natural gems has actually made every nugget of the gem world quite precious! Featured today is a natural imperial golden yellow topaz of 3.36 carats. The oval shaped natural yellow Topaz from Brazil is fully natural and treatment free and has the top imperial golden yellow color. 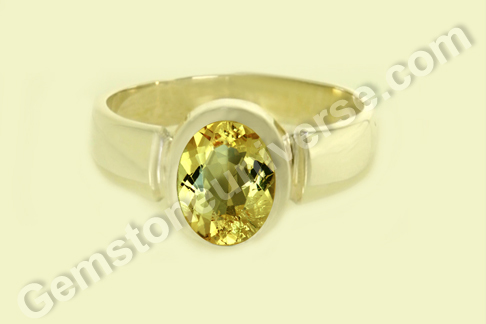 The gem is eye clean and lustrous and has been set in sterling silver as Jupiter golden yellow topaz ring. 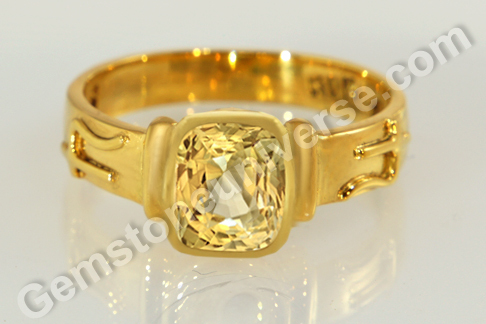 Imperial golden yellow topaz is the substitute/ alternative gem or upratna for natural yellow sapphire or pukhraj. It is the gemstone of Jupiter/ Brihaspati/ Guru and is the jyotish rashi ratna for zodiacal signs/ rashis of Sagittarius (Dhanu) and Pisces (Meen). 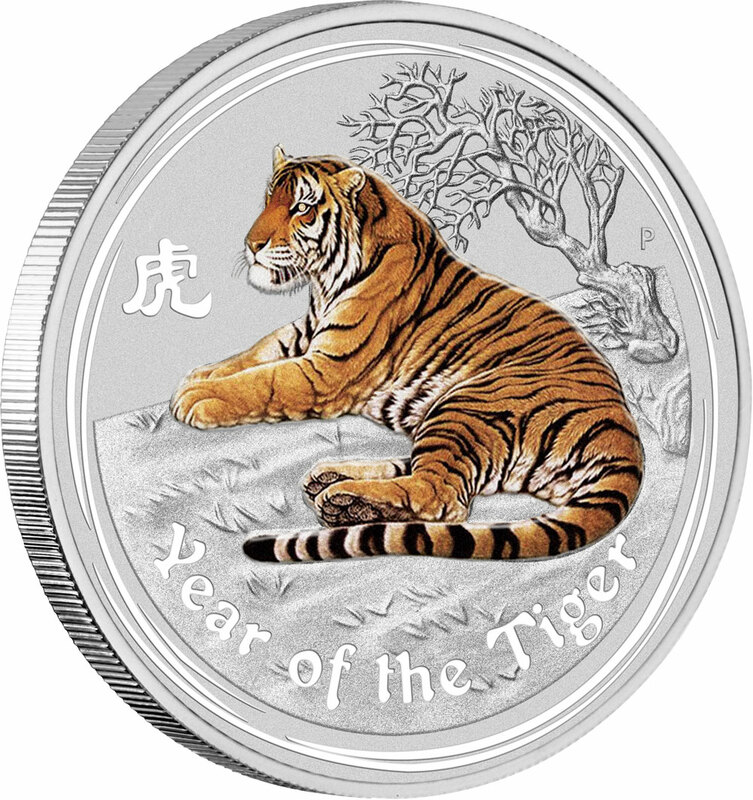 Enjoy a special coin commemorating the Chinese Year of The Tiger in 2010. 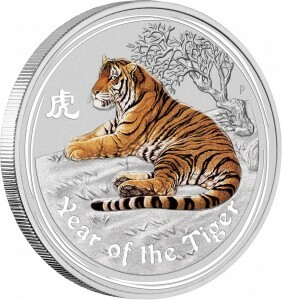 The Perth Mint in Australia, issued coins of pure silver with eye of the tiger being an inset of golden topaz! The limited mintage ensured that no more than five thousand coins were issued. The weight of each silver coin in this limited mintage was 1 kilo. The coin was priced at USD 2827. Comments Precious natural gems infuse life. They add meaning. They inspire. Featured today is a lovely 2.77-carat natural treatment free blue sapphire from the famed gemstone mines of Srilanka. 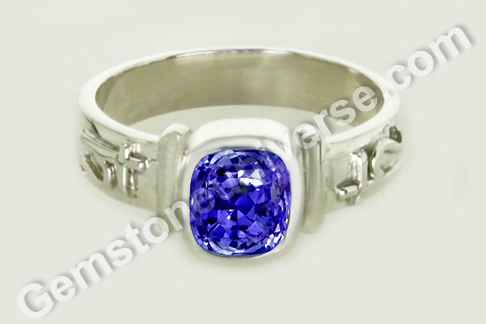 The fine cushion cut Ceylon blue sapphire has a rich and appealing silky cornflower blue color. It has a good jyotish weight, excellent clarity and great lustre giving this masterfully cut gem a shimmery appearance. 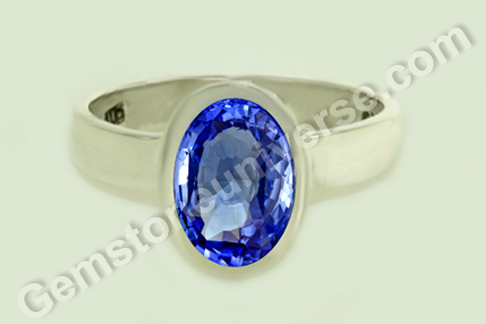 Natural blue sapphire or neelam gemstone is there a gem of Lord Saturn/Shani. It is the jyotish rashi ratna for the Zodiac signs of Capricorn and Aquarius. 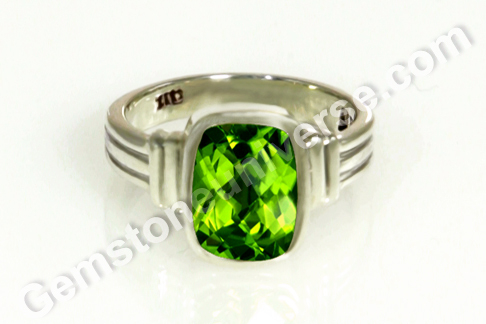 This gemstone is an intensely powerful and fast acting gem and gives tangible results in planetary gem therapy. Here is an interesting piece of information, the distinctive blue bottle of the famous gin brand Bombay Sapphire*, is said to have been inspired by the famous star sapphire ( displaying asterism) – the star of Bombay – the 182 carat cabochon cut star sapphire, now housed at the Smithsonian Museum. 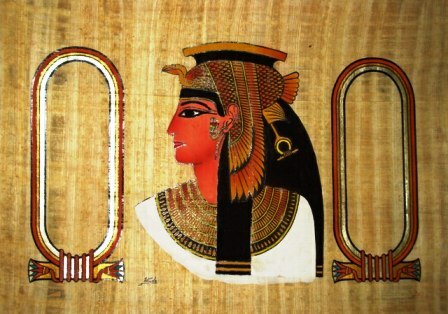 The name “Sapphire” and the gem that adorns the logo were inspired by this exceptional gem. The splendid gem from Srilanka was presented to silent film star Mary Pickford by her husband, Douglas Fairbanks Sr., and she bequeathed it to the Smithsonian Institute in 1981. *Gemstoneuniverse does not endorse any other brand or consumption of spirits. Comments A trained eye can tell a precious gem apart but it takes much more to glean out the jyotish grade gems from the scores put together in gem parcels. A jyotish quality gemstone will stand out among several for you cannot hide the aura of real power. Featured today is an exceptional gem – a super premium natural unheated Ceylon yellow sapphire. The natural Yellow sapphire from Srilanka is an amazing 3.90 carats of pure charisma, set in 22 karat gold as a Jupiter talisman ring. The cushion cut yellow sapphire has the top canary yellow color – ultimate desirable color in a yellow sapphire. The gem has excellent clarity and lustre – its a brilliant piece! 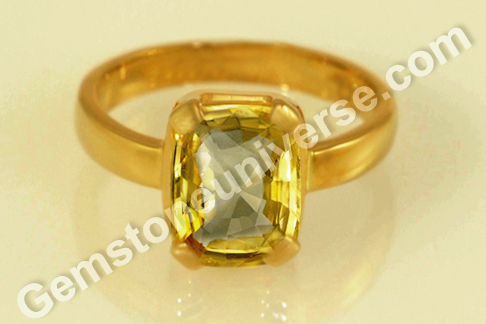 Yellow sapphire also known as pukhraj or pushyaraag in Hindi is the gemstone of planet Jupiter/ Guru/ Brihaspati. It is the jyotish rashi ratna for the zodiac signs of Sagittarius and Pisces. 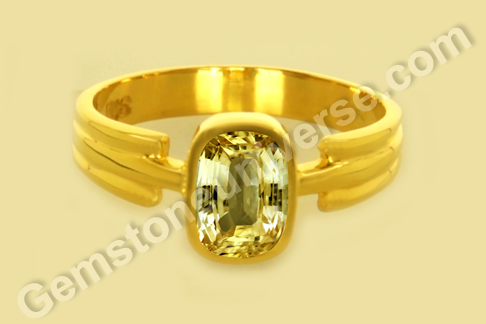 The natural yellow sapphire is a very popular gemstone. Sapphire is also regarded as the birthstone of the month of September. Buyers looking for genuine natural yellow sapphire must educate themselves for the markets are full of unscrupulous elements that will palm off imitations (synthetics) or simulants (those that may appear similar)to make a kill. Synthetic yellow sapphire is made in the lab using flame fusion as well as the flux growth method. These are often used in manufacturing of jewelry. Chatham lab grown sapphires – too good to be true! Ethical practices require disclosure of the facts – whether a gem is natural or lab grown; whether a gem has been treated to enhance in any manner whatsoever! A certification from a good lab ascertains both. The word ‘natural’ can only be written for naturally occurring mineral found and sourced from earth and devoid of treatment. Comments The result of harmony is indeed something splendid. Especially, when the creative and powerful forces of the universe come together. 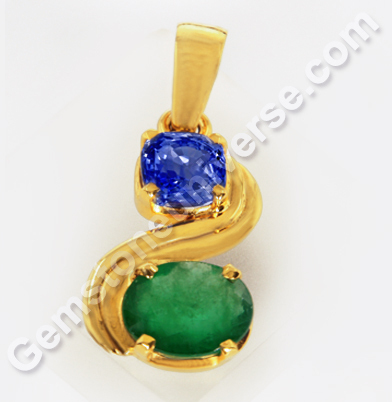 Featured today is a fine two gem pendant having a natural and treatment free Ceylon Blue sapphire and a natural and treatment free emerald from Brazil. The rich colors as well as planetary energies complement each other making for a fine talisman. The cushion cut natural unheated blue sapphire from Srilanka has a good jyotish weight of 2.99 carats and an eye – catching electric sky blue color. Most of the weight of this gem lies in its belly. This blue sapphire with excellent clarity also has amazing lustre. 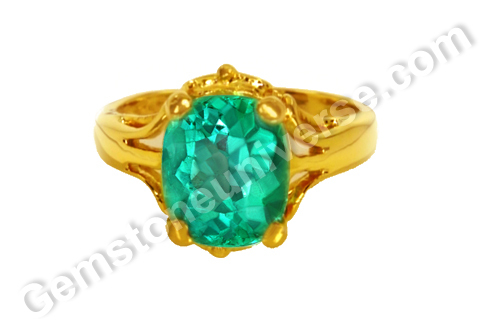 The oval shaped natural emerald from Brazil has a fine rich emerald green color and a good weight of 2.93 carats. The two gems have been set in 22 Karat gold as a two gem pendant. 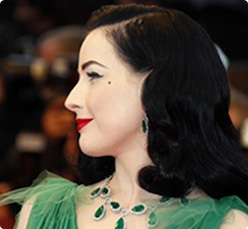 Natural emerald / panna gemstone is the gemstone of Mercury / Budh. It is the jyotish rashi ratna for the zodiac signs of Gemini (mithuna) and Virgo (Kanya) – the signs ruled by Mercury. If you are able to do both, you have crossed the biggest hurdles. Comments Gorgeous and irresistible. This gem is an absolute validation of ‘Small is beautiful’. And it is not just because of its beauty, gemology experts have always opined that in case of the mineral corundum, even a one carat gem can beat other biggies in value, it is a top quality gem excelling on the 4 C’s. Featured today is a fantastic natural Ceylon yellow sapphire of 1.94 carats set in 22-karat gold as a Jupiter talisman ring. The cushion cut yellow sapphire from Srilanka has a coveted canary yellow color an electric lustre giving it great allure. One look at this scintillating beauty and you can see that it is an eye clean gem. 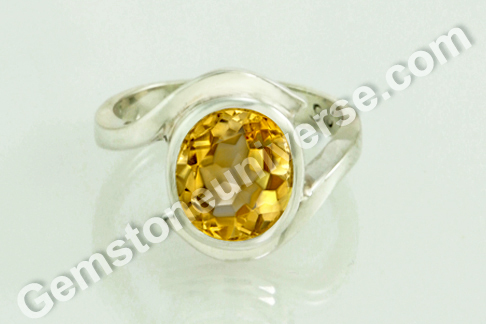 Yellow sapphire is one of the most popular navagraha stones in India. Besides its appeal of being a herald of wealth, wisdom and good fortune, it is also known as a great healing gem. It is a gem that is believed to help alleviate stomach related troubles as well as give relief in vata and kapha related ailments.